A coproduction of Canadian Stage and the Royal Winnipeg Theatre Centre, Lucy Kirkwood’s Chimerica has opened in a dazzling production directed by Chris Abraham. The starting point of Kirkwood’s 2013 play is the famous photo taken taken during the 1989 Tiananmen Square uprising of a lone man standing in front of a line of tanks. From this Kirkwood spins an epic three-hour-long tale concerning the lives of the photographer and the man in the photograph. Abraham is known for drawing fine performances from actors and here the acting is of the same high standard across the board. What’s new is that Abraham shows that he can also direct such a large-scale multi-media production with panache. While one can appreciate Chimerica for its complex storytelling, by the end one wonders what, if anything, the story is supposed to mean. 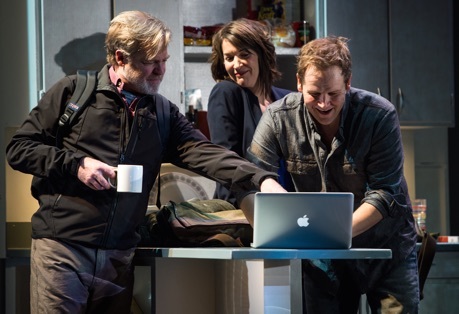 In 2014 Chimerica won both the Evening Standard Award for Best Play and the Olivier Award for Best New Play. 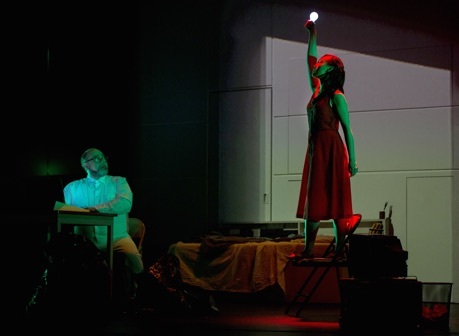 Hopping between China and the United States with dialogue in both English and Mandarin it reminds one of epic Canadian plays like Robert Lepage’s Lipsynch (2007) or Wajdi Mouawad’s Incendies (2007). The difference is that both Canadian plays organize their stories around a particular theme – the meaning of voice in Lepage, the nature of family in Mouawad – while Kirkwood’s play has only Chinese-American relations as its organizing topic. Since Kirkwood does not actually investigate Chinese-American relations in the play, this topic is really only a description of the locations in her plot. The title comes from a word coined by historian Niall Ferguson to describe the combined influence of the two world’s biggest economies that together make up a quarter of the world’s population and a third of its gross domestic product. The name also recalls the word “chimera”, a monster in Greek mythology made up of parts of three different animals. The word has the additional meaning of “a mere wild fancy; an unfounded conception” (OED). Kirkwood could play off these associated meanings, but, strangely, does not. Kirkwood’s play opens on June 5, 1989, with photojournalist Joe Schofield (Evan Buliung) in his Beijing hotel talking on the phone to his newspaper editor Frank (Ross McMillan) in New York, when he looks out the window and stops to take the famous photo. (The real photographer was Jeff Widener working for AP.) The time then shifts to the U.S. presidential campaign in 2012 when Joe and his buddy Mel (Doug McKeag) are sent to Beijing to report on life in Chinese factories. On the flight over, the meet Tess (Laura Condlln), a British market profiler, who is being sent to China to gauge how to market credit cards to the Chinese. After his visit to China, Joe becomes obsessed with knowing what happened to the man in the photo whom he calls the “Tank Man”. He notifies his contact in Beijing, Zhang Lin (Paul Sun-Hyung Lee), an English teacher, who can tell him nothing. Joe’s editor is cool on the idea of Joe wasting time on a quixotic quest during election season, until he’s is notified of a strange message that appeared in a Beijing newspaper that suggests the Tank Man is now living in the U.S. Joe’s search takes up the remainder of the play as the field for his search narrows to New York City. Meanwhile, Joe’s relationship with Tess develops and scenes in the U.S. alternate with scenes in Beijing concerning Zhang Lin, his brother Zhang Wei (Richard Lee), who runs a factory and Ming Xiaoli, Zhang Lin’s neighbour who is dying from emphysema caused by Beijing’s worsening air pollution. At the same time, Zhang Lin is writing his memoirs about meeting his wife and their first years of marriage. Although Kirkwood is masterful in handling the actions of her 32 characters, one keeps hoping that the play will eventually start to be something more than just a complex story. Unlike the best plays, Kirkwood’s subplots do not help illuminate her main plot. And even taken together, the plots cast up many topics – ethics of journalism, the power of images, the effects of globalization, the difference of East and West. But Kirkwood’s play does not develop these topics or analyze them. After three hours of dense plotting all we learn from the play is the point that China, although it has become an economic power and is becoming Westernized, is still fundamentally Chinese and different from the U.S. Kirkwood even gives Tess a lecture on this subject in case we are looking for meaning in the play. Yet, this notion should be obvious to anyone with even a casual acquaintance with international news. Just because Chinese citizens can now buy luxury goods doesn’t mean China has suddenly become a democracy. With this as her only revelation, Chimerica is intellectually very disappointing. One need only think of all the ideas colliding and illuminating each other in each three-hour part of Tony Kushner’s Angels in America (1991 and 1992) to realize how empty Kirkwood’s play actually is. Even in a story with all its complex plotting, Kirkwood manages only one significant twist. The identity of the Tank Man, which one might think would be the main revelation of the play, Kirkwood reveals early on so that all we do during Joe’s pointless searching is wonder when Joe will come to the same conclusion we have. If neither the story nor Kirkwood’s insights are especially satisfying, Chris Abraham’s production of the play certainly is. Judith Bowden’s set features a revolve divided in half by a wall. When one half is facing the audience, the other half can be loaded for the next scene so that Kirkwood’s multitude of scene changes happen swiftly, smoothly and almost cinematically. It’s particularly effective when a character exits a scene on one side only to enter the next scene on the other. Abraham occasionally has the revolve stop in mid-turn so that the wall becomes a wall separating two people phoning each other, usually one person in the U.S. and the other in China, as if a wall than rather merely an ocean separated the two. At the same time, Abraham has video designer Deco Dawson project videos onto the wall as it turns, sometimes establishing the location of a scene, sometimes its subject matter. In every case, when the video stop to fade out, Dawson allows an image of the film perfs to remain on one side or other of the wall, thus reminding us in every scene that the show is (or should be) about photography and the relation of reality to the frozen image. In these ways, Abraham’s physical production is more insightful that Kirkwood’s text. Abraham also draws superlative performances from the entire cast, the main problem being that Kirkwood’s characters, with the exception of Zhang Lin, are generally rather dim. Evan Buliung is such a fine actor that he helps us get caught up in Joe’s enthusiasm for the quest even though it is foolish, naive and ultimately pointless. Laura Condlln is great at suggesting that Tess’s British accent and proper behaviour is really only a façade for someone with rather ordinary desires. Zhang Lin, as played by Paul Sun-Hyung Lee, is the only character with much depth or complexity. Lee shows that Zhang Lin is quite able to put on a jovial demeanour with visiting foreigners, but that alone or with his brother he is pessimistic about the present and wracked with memories of the past. After the death of his neighbour, Zhang Lin writes a letter of complaint about the deliberate misreporting of pollution levels in Beijing knowing full well that he will he arrested. Lee’s ability to show a man acting with the knowledge of the negative consequences is very impressive. Other than Doug McKeag, who plays Joe’s buddy Mel, all the other actors play two or more roles. Richard Lee plays both Zhang Wei, the practical brother of Zhang Lin, and Pengsi, a man living in New York who is suspicious of others and feigns not speaking English. Terry Cherniack is very funny as Joe’s editor’s prim secretary Doreen and icily formidable as Maria Dubiecki, a Democrat senator running for re-election. Norman Yeung and Jasmine Chen stand out for their sensitive, almost balletic portrayal of the young Zhang Lin and his fiancée Liuli. It is probably possible to enjoy Chimerica simply for the theatricality of its presentation and naturalism of it acting. In the end, however, most people will wish that the story had some resonance or insight to offer. Kirkwood has written a large-scale play, but unlike the large-scale plays of Robert Lepage, Wajdi Mouawad or Tony Kushner, it is almost entirely concerned with plot. At the end, one tends to feel exhausted rather than exhilarated as it becomes increasingly apparent that Kirkwood has taken so much time to say very little. Photos: Evan Buliung and Paul Sun-Hyung Lee; Doug McKeag, Laura Condlln and Evan Buliung; Paul Sun-Hyung Lee and Jasmine Chen. ©2016 Dylan Hewlett.